Casey Construction are continuing to make good progress with the work. 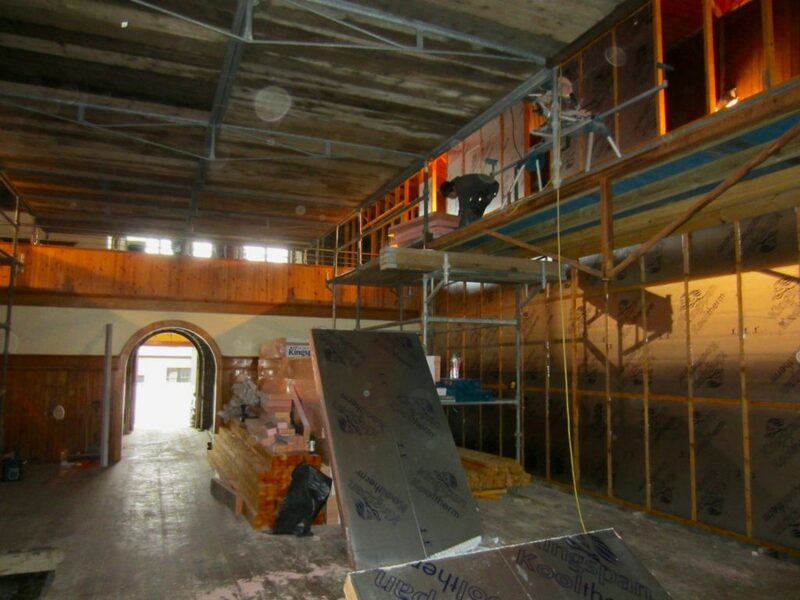 Insulation work is now almost complete and plasterboard linings are being fitted. 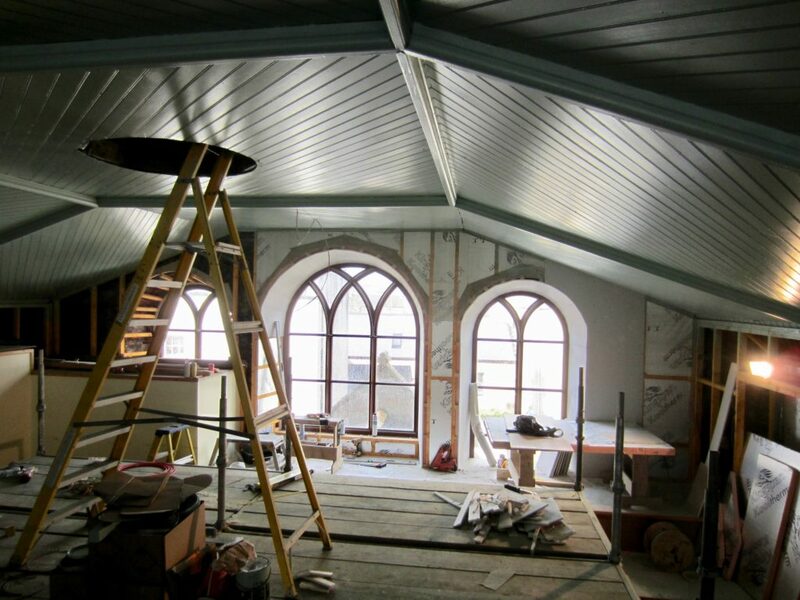 Meanwhile, at the upper level, decoration work is progressing at the ceiling. At the back of the balcony framing, insulation and plasterboard linings coming along well. 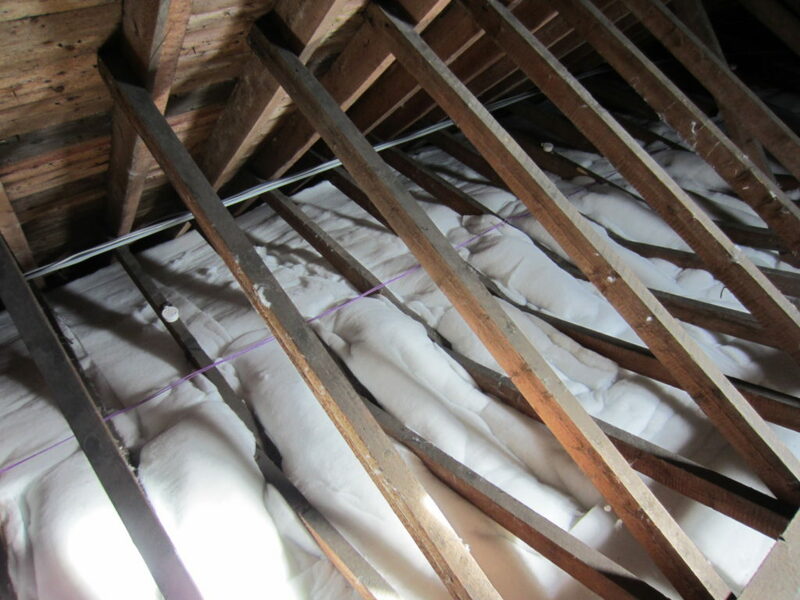 And in the roof space- insulation has been fitted. The whole building is being rewired, with a new electrical boards and switchgear. All will be hidden away in a separate cupboard. 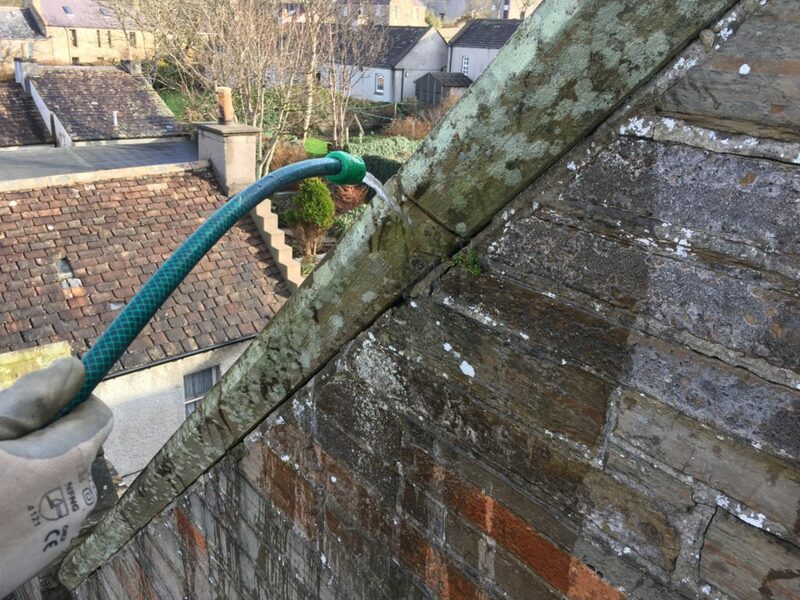 In the next couple of weeks, scaffold will be erected at the main frontage to carry out repairs to the stonework and to replace the porch roofing. Thanks, everyone for your continued gifts and donations. 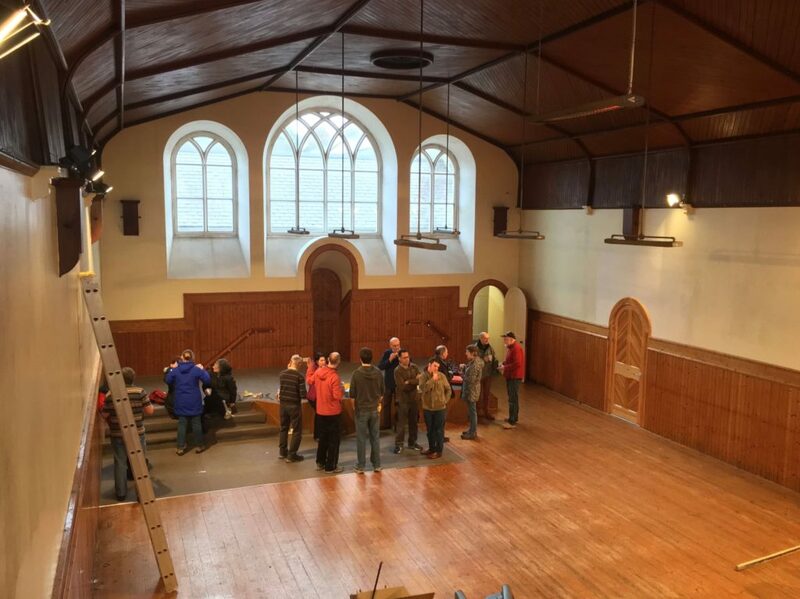 Inspections have shown that considerable extra work is needed to repair the floor joists and add new floor supports as well as additional repairs to the main church frontage. If you would like to contribute, please contact us using the details on the contact page. To download a PDF of this poster, click here. 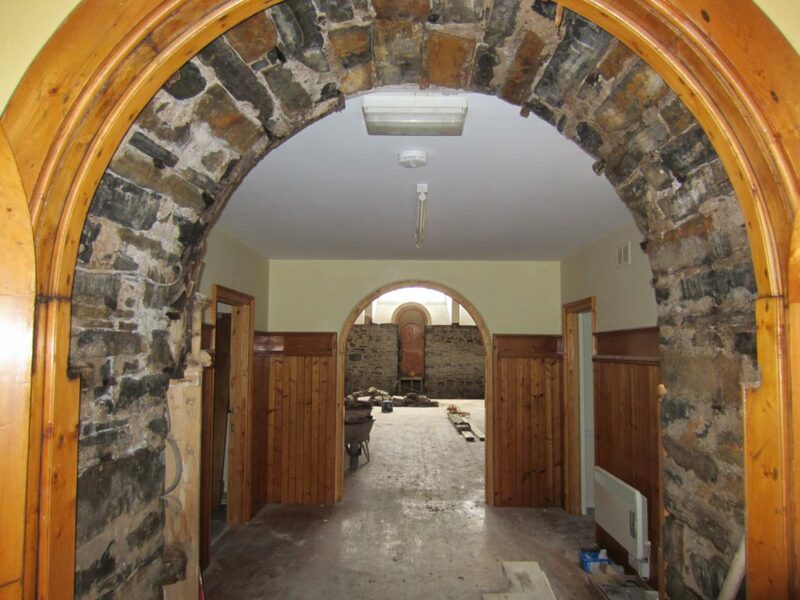 Casey Construction are making good progress with the work in the inside. 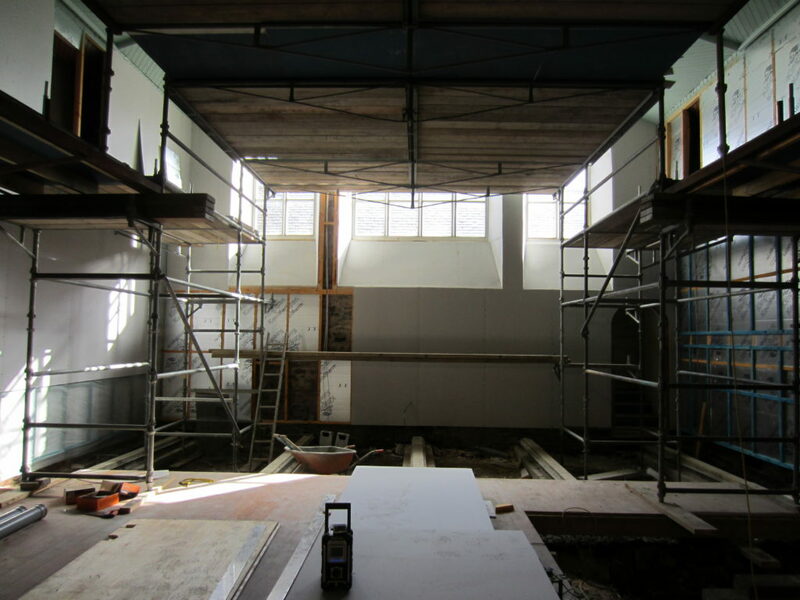 Scaffold and a platform to access the ceiling have been erected and the wall framing is being fitted. 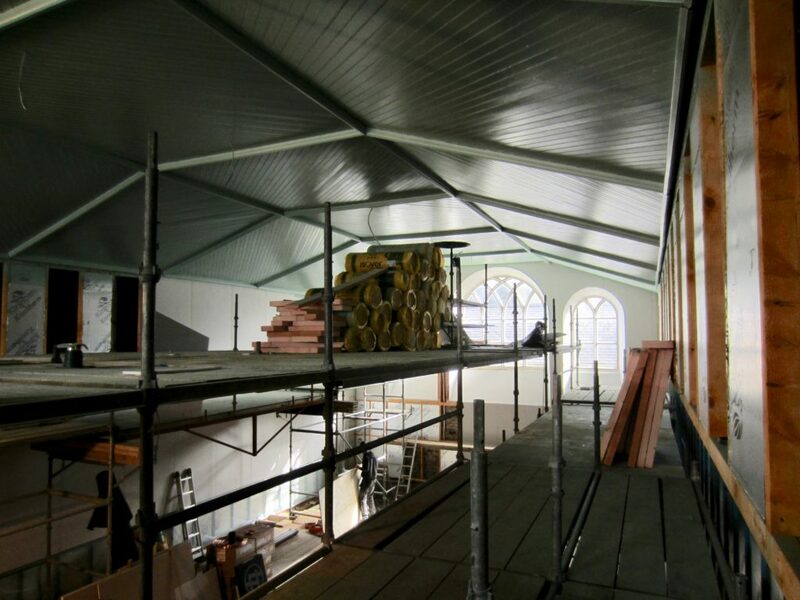 The pit to take the new baptistry is almost ready and insulation is being fitted in the new timber framing. 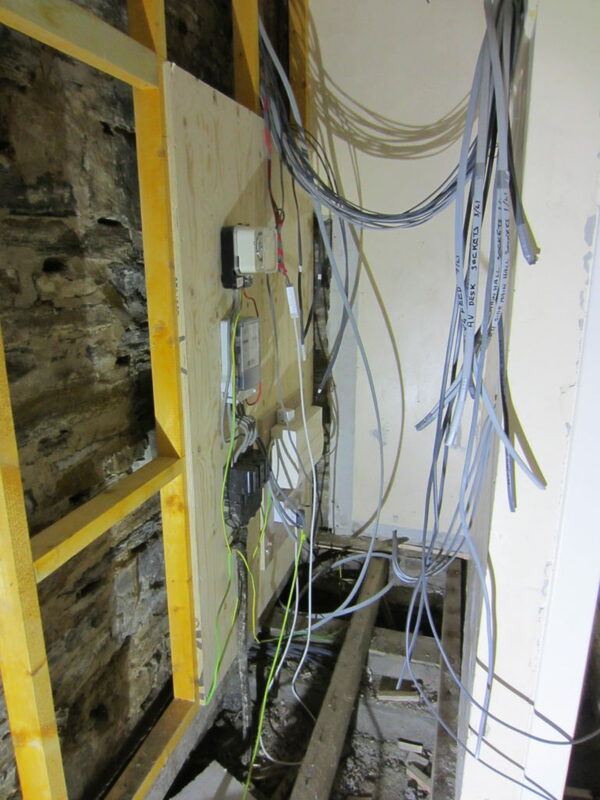 During the works, opening out the old walls and floors, a number of problem areas have been found so floor joist ends and supports will need to be replaced. 130 years with no damp course has left its mark. 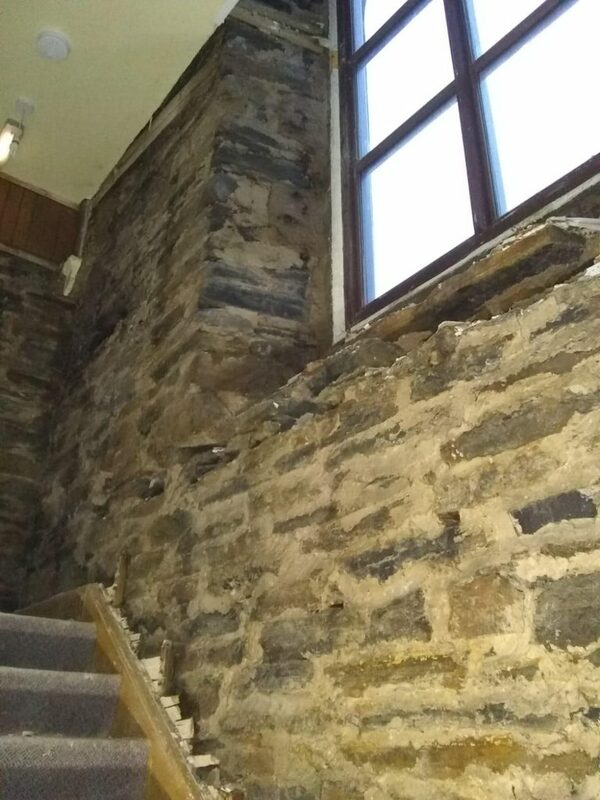 The wall at the stair and above the windows and porch have been found to be particularly damp so an investigation was made of the west facing gable. 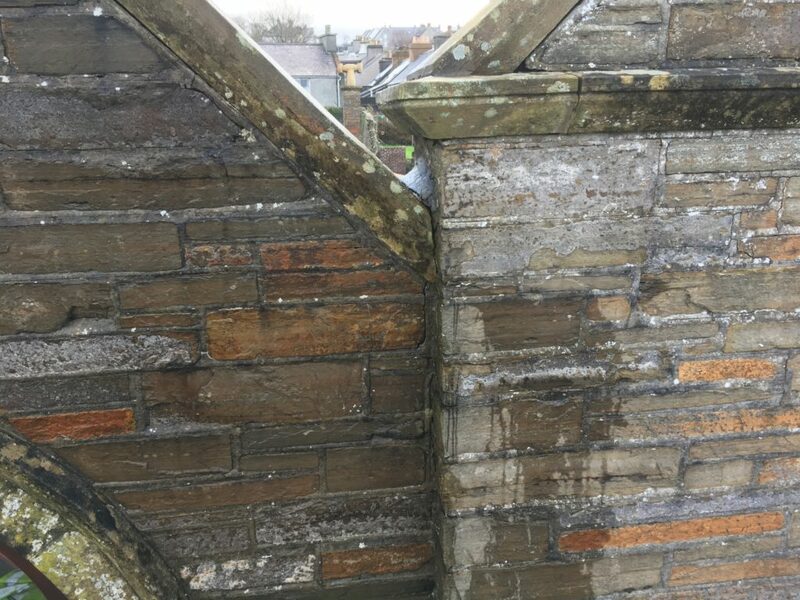 Sadly there are so many open joints in the stone that the gable is going to have to be repointed. 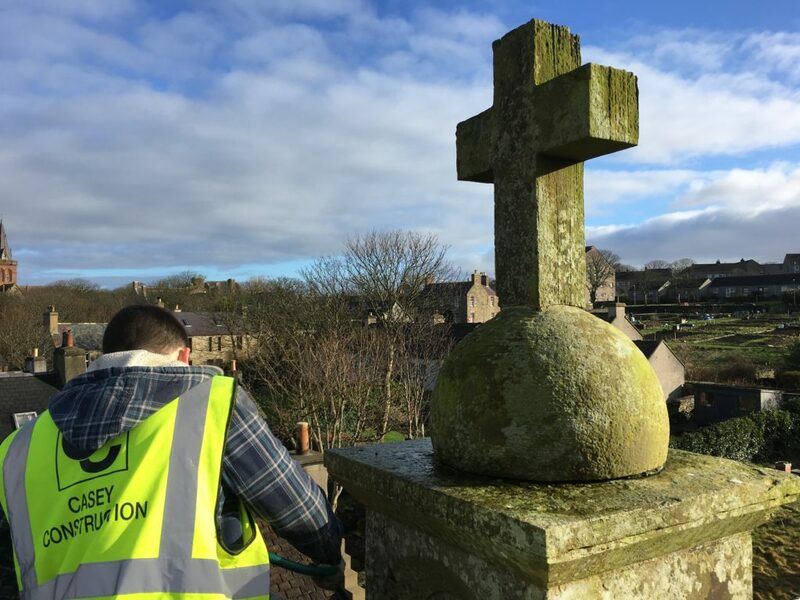 The Cross and globe at the top of the gable have been found to be loose, so a new fixing pin will need to be fitted. 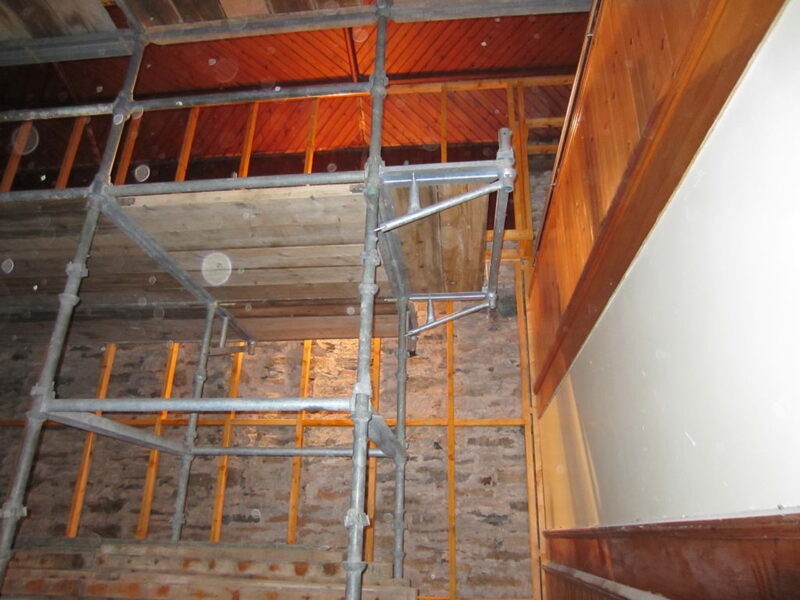 We didn’t anticipate these additional repairs, so your continued support and contributions are very much appreciated. If you would like to pledge a regular amount or make a donation, please email me at the address in the contact page. Gift Aid would also maximise your gift if you are a tax-payer. Details are on the form we will send. Our thanks too, to Mr Casey and his staff for the excellent job they are doing on the renovation work. 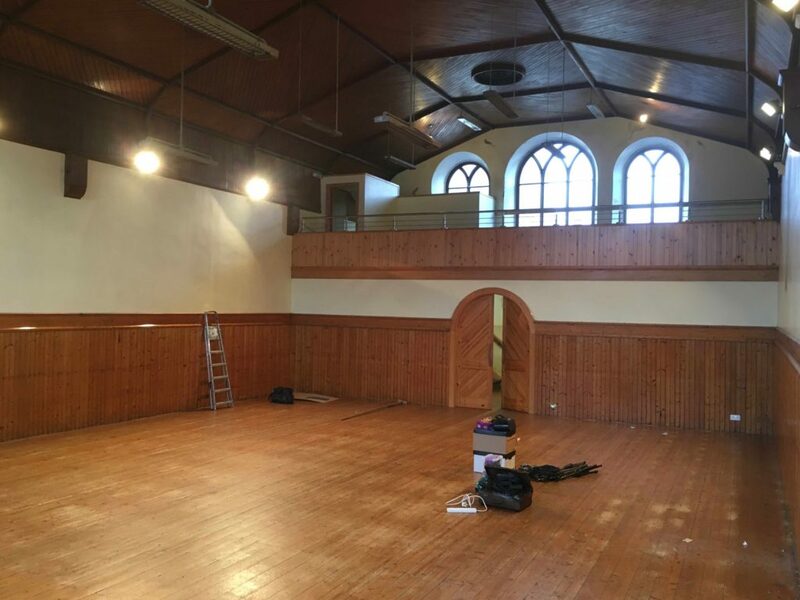 Thanks to all the volunteers who cleared the building on Saturday 9th February. There were many more than the number here! 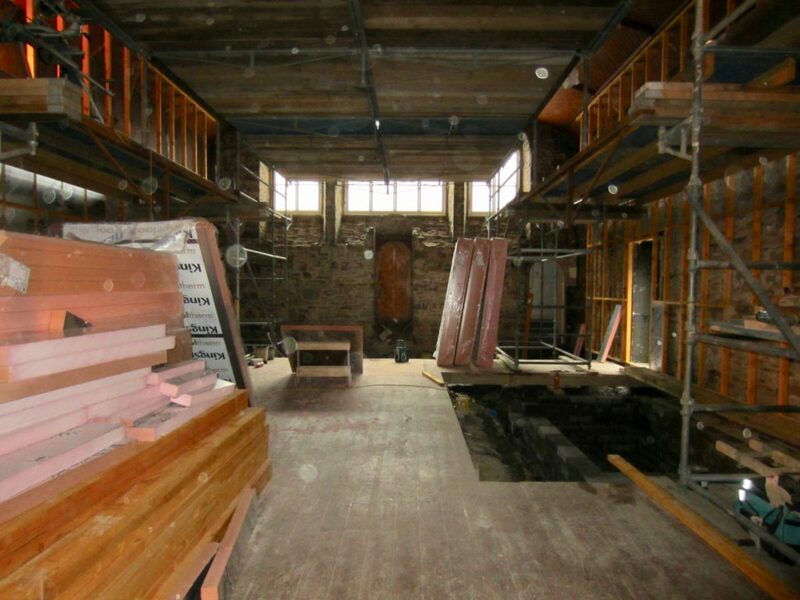 It didn’t take long to empty the works areas. 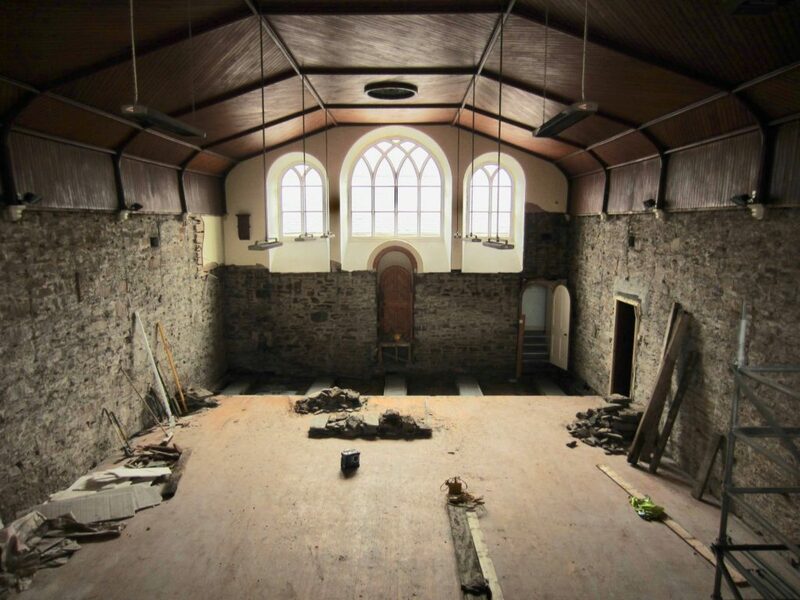 By the end of the first week’s work, tradesmen from Casey Construction Ltd. had removed the old platform and external walls were being stripped back to the stonework. 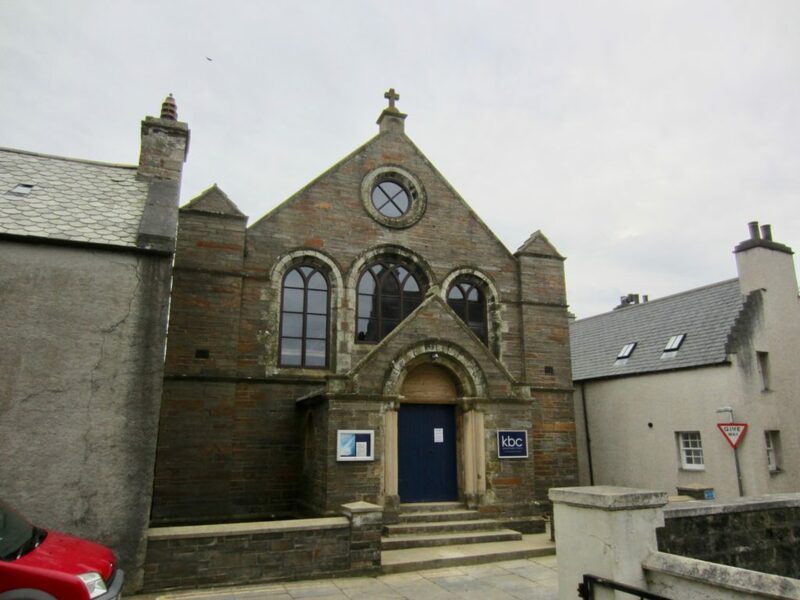 Somewhere within these walls there is a time capsule placed by the United Presbyterian Church minister Rev Soutar during the building’s construction in 1888. The country was celebrating the Golden Jubilee of Queen Victoria at the time. 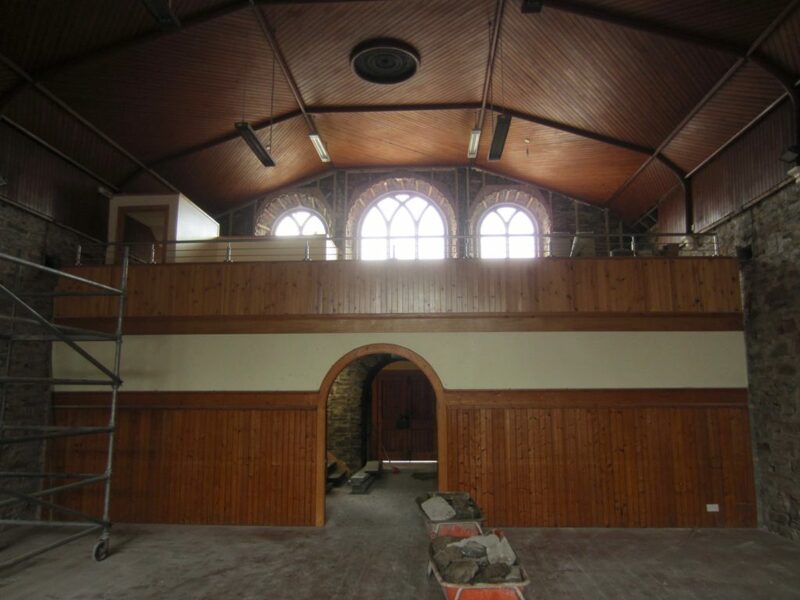 You can read an extract of the history of the building here. 6:15 pm Blue Christmas – when Christmas hurts. A service especially for people who find Christmas a sad or difficult time. 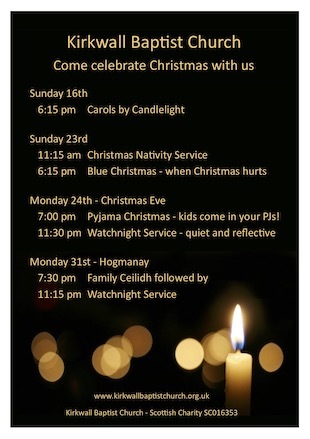 7:00 pm Pyjama Christmas – kids come in your PJs! 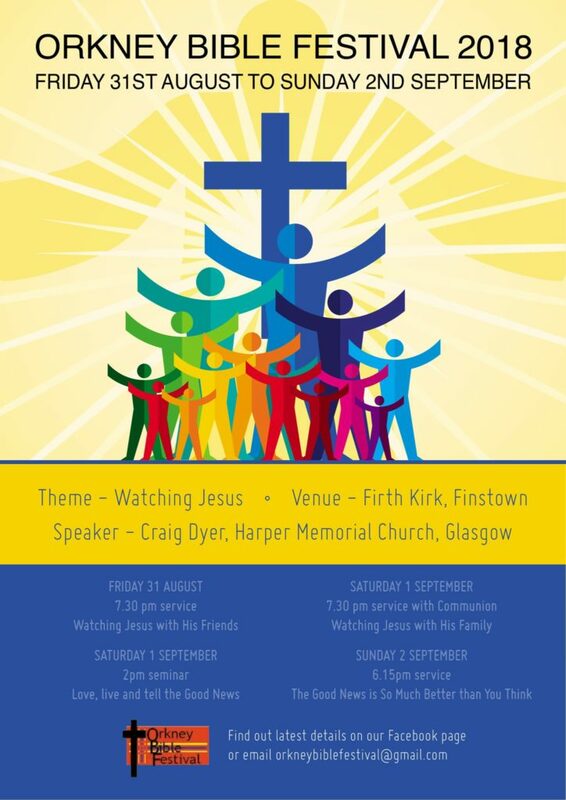 To download a printable A4 poster for the events click here. 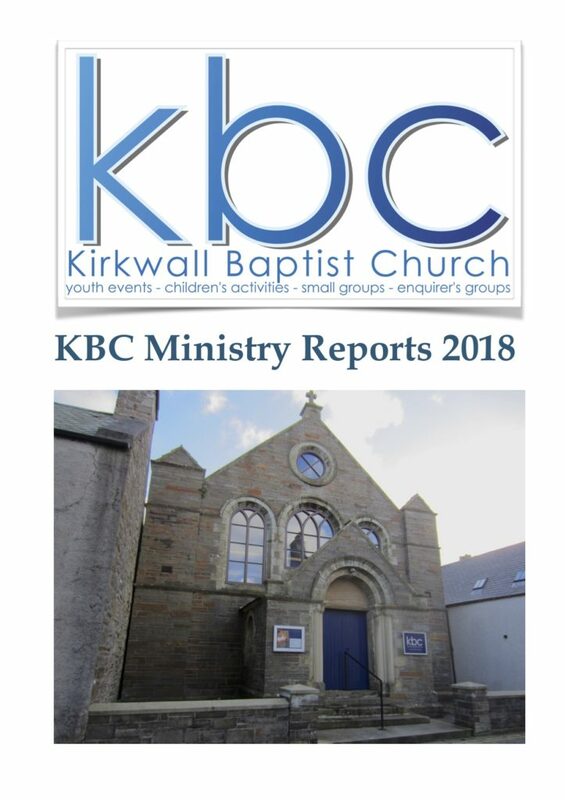 Click on the image to download a PDF file of the Ministry reports for 2018. To download an ePUB version to view on your smartphone or tablet click here (.zip file needs to be unarchived). Everyone is welcome on board and to the activities. For full details download the PDF leaflet by clicking here or click on the image below. 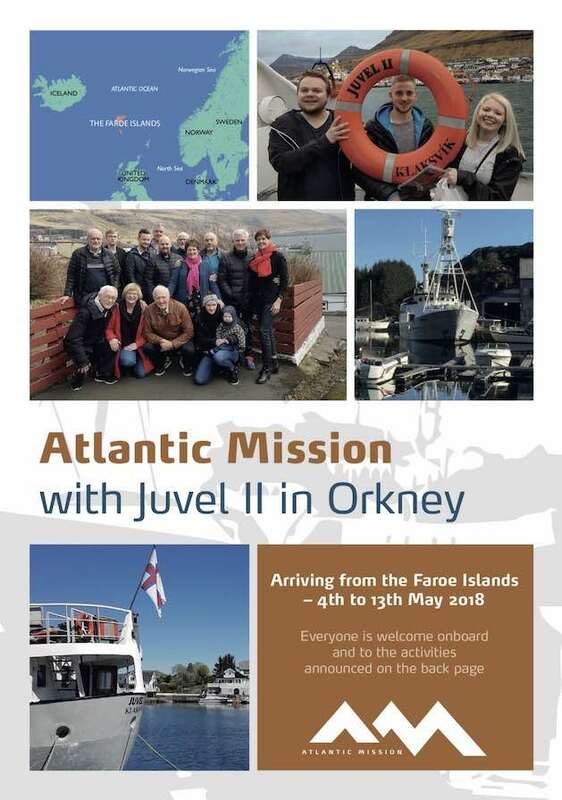 Juvel II will be in Orkney: Kirkwall: May 4th – 6th, Lyness: May 7th – 8th, and Stromness: May 9th – 13th. A Christian Bookshop and the charities, Cafe Bless and Go Go Olive, will be onboard on Saturday the 12th from 2 pm to 4 pm. – to share the Gospel of Jesus Christ, in our own and our neighbouring countries. – to encourage the local church, and help them to proclaim the Gospel of Jesus Christ. 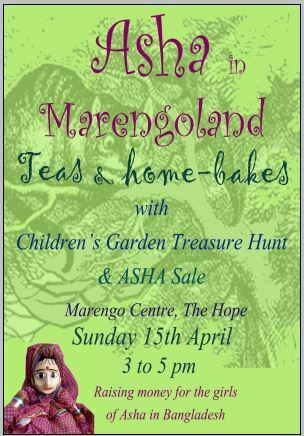 Our Orkney friends and supporters: please come along to Asha in Marengoland in St Margaret’s Hope on Sunday 15th April at 3:00pm for tea and kids activities plus a small sale. Raising money for the gils of Asha in Bangladesh. More information at the Asha Facebook Page. Lunchtime Reflections in St Magnus Cathedral: Monday, Tuesday and Wednesday at 1:15pm: 15-20 minutes of reflection as we focus on Jesus’ journey to the cross. St. Olaf’s (12:00pm), East Kirk (12:25pm), Peedie Kirk (12:50pm), Baptist Church (1:15pm), Catholic Church (1:40pm), Salvation Army (2:05pm), St. Magnus Cathedral (2:30pm), followed by ‘Café Church’ at the Christian Growth Centre (3:15pm). There will be a short service (10-15 minutes) at each church. You are welcome to join us for all or part of the journey. 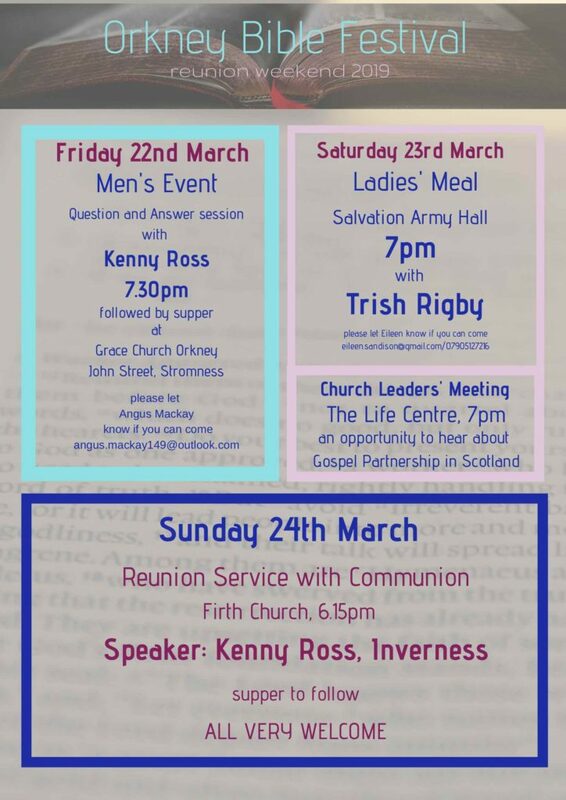 Good Friday at 7:00pm: The Salvation Army and Kirkwall Baptist Church Joint Good Friday Service at The Salvation Army Hall. Easter Sunday at 11:15am: Easter Family Service. Rev. Tim Proudlove. Easter Sunday at 6:15pm: Service led by Youth Spring Camp Team, with Ally Heath.